Field runs E/W, just north of the tunnel entrance. There is a clear 250m from the power lines to land. Very slight gradient from west to east. This is generally a good safe site with a nice friendly flat, soft top landing. 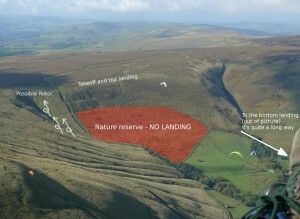 Dale Head can often be flown when it would be too windy to fly Mam Tor. It is a good site for low airtime pilots who can soar confidently. XC potential is very limited because of airspace restrictions and no progress can be made downwind beyond Whaley Bridge. However, it is excellent for ‘training hops’ back to Chinley Churn. Beware of rotor in the gulley south of take-off when the wind is off to the south. No Access from Dale Head Farm. Only top land or bottom land in the designated field; no slope landings are permitted, as there is an important Nature Reserve with very restricted access in the valley immediately below. Do not fly this site unless you are absolutely sure that the conditions and your ability will allow you to either stay up or land in the designated field. This site may be shared with model aircraft. There is limited parking on the A625 2 miles from the junction with the A6, grid reference SK 093 825. No direct approach can be made from the valley below via Dale Head Farm. The usual approach is from the parking place on the A625 via a bridleway to Chapel Gate. At the hilltop turn north until the track begins to descend, then follow a vague path along the rim to take off. Alternatively approach from Edale via Barber Booth and the Chapel Gate track which runs through the Lords Seat bottom landing field, (this is longer, with more uphill).